Global players like Tudor, Fortress and Bluecrest have expanded their local presence in Singapore and view Asia as an unique market set with many interesting investment opportunities, where many different strategies across various business units can be applied. This confirms Singapore's reputation as a reliable wealth management center. International family offices are also opening offices there to establish a safe hub for the family assets and its related management. Compared to ten or even five years ago, Singapore today offers a rich ecosystem for alternative investment managers. Close to 30 fund administrators are now in Singapore. Over 50% of global foreign exchange reserves belong to Asian countries – but when will these assets be managed by Asians? While a lot of money is invested in Asia, a good amount of it is actually recycled money - meaning that the funds were created through excess savings in Asia. Those funds were then channeled out to Western institutions, who reinvest them back into Asia. It is likely that in the near future this circle will change and more Asian savings at the individual, institutional and sovereign levels, will be directly invested into Asia through Asian funds. Asian sovereign wealth funds have been asked to help kick-start funding and ease the start-up challenges of hedge funds in Asia. In the past, potential investors perceived a lack of talent or experience, but these days, new managers tend to be traders from the global investment banks, sovereign wealth funds or other larger hedge funds, with years of experience and solid track record. The talent pool has matured, and has been recognized by international investors who continue to allocate to Asian managers. What does the Chinese Renminbi fixing at 9:15 am Beijing time mean to the world? One generation back, fund managers in Asia during the 70s and 80s were largely trading the “side effect” of whatever happened in Europe or the U.S. That meant that in order to trade Asia well until the 90s, a major component would be one’s understanding of what the Fed or the ECB would do in terms of monetary policy, as well as all the respective economic developments in the West. However, from 2010 onwards there was a noticeable shift of the global markets toward how China Renminbi fixes the Renminbi in the morning at 9:15 am Beijing time. This fixing has morphed into a very important event just like the 11a.m. London LIBOR or the 10 a.m. New York fixing had become over the years. Meaning that now, London traders might have to be awake at 1 a.m. to watch the China fixing or Chinese inflation figures, just like traders in Asia have to be up at 2 a.m. on the day of the FOMC announcement. Twenty years ago, if inflation in China came out at +10% or -10%, it would have had no impact on global investor sentiment. However, if Chinese inflation hits +10% or -10% today, it would be a major cause for concern. What are family offices investing in? What is the “right” risk reporting and transparency when communicating with investors? Which risks for the global economy do Asian managers see? How do emerging Asian hedge fund managers survive and succeed? How do you raise money in Asia? How do statistical concepts like bi-polarity and heteroskedasticity help macro traders deal with a changed world? 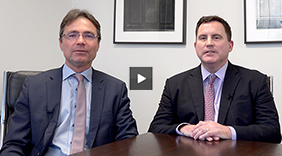 What are the benefits of EUREX' new Client Asset Protection program, and who can participate? Why have family offices expanded internal trading and hired more former bank prop traders?